Indoor activities in San Francisco include visiting our top museums, exploring some of our best attractions, and heading to a concert. You can catch a theater production, attend a ballet performance, or enjoy an opera. Other fun things to do indoors including some of our top film festivals, as well as beer and wine tasting festivals. Another one of my favorites is heading to a Golden State Warriors or San Jose Sharks sporting event. Read on for a list of my 25 favorite things to do inside on those rainy and cool SF days. One of the best indoor activities in San Francisco is visiting our wonderful museums. They include everything from history to art to family friendly fun. Read more about each of the top museums, or click on the link at the bottom for a full list of SF museums. The California Academy of Sciences is San Francisco's premier science museum, containing a planetarium, four-story rainforest, aquarium, and natural history museum all under one (living) roof. 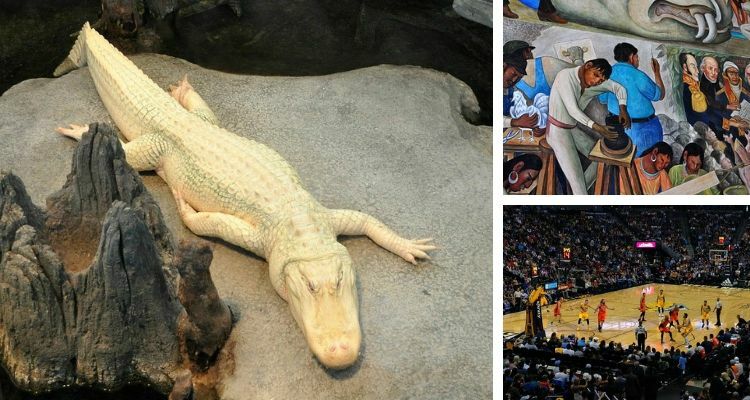 This eco-friendly architectural feat also houses an earthquake exhibit and Claude, the albino alligator. This is one of the indoor activities in San Francisco where you will find so much to discover, you could spend a whole day here, or even an evening! On 21+ Thursday nights, the museum comes alive with music and cocktails. The Cal Academy is located in Golden Gate Park. This popular downtown museum has recently made its debut after an extensive three-year makeover, which expanded it to twice its original size. You now get to enjoy 10 floors of artwork, including four permanent exhibits and over a dozen temporary ones. Whether you love photography, modern architecture, or contemporary paintings by famous artists such as Henri Matisse and Diego Rivera, you will find lots to marvel at. The MOMA is located just a few blocks southeast of Union Square in the South of Market (SOMA) District. Just a block away from SF City Hall in the Civic Center District, you'll find the one-of-a-kind Asian Art Museum. This place has an impressive collection of artifacts from over 6,000 years of history. Let the various exhibits transport you to India, Persia, the Himalayas, Cambodia, the Philippines, China, and more. You'll see paintings, sculptures, jewelry, and pottery from every corner of the continent. This is truly a can't-miss museum whose diversity of Asian art you won't find elsewhere. The Exploratorium is a museum that kids and adults of all ages love. It's packed full of hands-on exhibits that let you discover for yourself how things work. The museum features five galleries: one about weather and the environment, one about the structure of living things, one on light and sound, one about energy and mechanics, and one about human perceptions and social behaviors. You'll find this fantastic museum on Piers 15 and 17 along the Embarcadero (about half a mile north of the Ferry Building). Are you looking for some additional museums to visit? Click the link below for a full list of ideas for indoor activities in San Francisco. Indoor activities in San Francisco also include many top attractions such as Alcatraz, Coit Tower, and more. Here are just a few of my top picks. While you will spend some time outside on the ferry (covered seating is also available) and walking from the shore up to the main prison building, most of the tour of Alcatraz is indoors. Delve into the fascinating history of what took place and who was held prisoner inside those mysterious walls. Explore the facility with a self-paced audio tour and take the ferry back whenever you're ready. This is such a popular attraction that going during the cooler, rainy season has the advantage of smaller crowds. Many visitors go to Pier 39 to walk around the wharf and peruse the variety of shops and restaurants, or snap photos of the sea lions. But you can also duck inside for an hour or two at the wonderful Aquarium of the Bay, which houses excellent exhibits of all the local sea life found in the San Francisco Bay. See stunning jellyfish, a giant Pacific octopus, and sharks and stingrays swimming around you. It's one of my favorite indoor activities in San Francisco. If you've seen pictures of SF from the eastern side, you've probably noticed a white tower sitting atop a small hill in the foreground. That would be the historical landmark Coit Tower, which was built in the 1930s and decorated inside with Diego Rivera-inspired murals commissioned by the Public Works Art Project. You can visit and learn more about these murals for free, or pay $8 to to ride the elevator up to the top for 360-degree views. To get here, you can either drive, take a bus that stops right in front, or walk up the stairs. You will find it in the Telegraph Hill district near North Beach. Who says visiting beautiful gardens has to be outdoors? One of the best indoor activities in San Francisco is visiting the historic SF Conservatory of Flowers, the oldest operating glass and wood greenhouse in the US. There you will see five totally distinct environments full of colorful, unique flowers. These include the Highland Tropics, Lowland Tropics, Aquatic Plants, Potted Plants, and the Dahlia Garden. This living museum resides within Golden Gate Park. In addition to the options above, you will find additional indoor activities in San Francisco through the link below. If you enjoy live theater, San Francisco has lots of options for you. Every month, you can catch an array of shows, from dramas to comedies to Broadway musicals. Many are well-known Tony Award-winning productions, while others are written and produced by local talent. The city has several historic theaters that are works of art in themselves. Dozens of large and small venues are found in between the Civic Center and Union Square districts. Here are just a few of the top upcoming shows. The SF Ballet, the oldest ballet company in the US, offers performances from January to May each year. Shows include ballet classics like Swan Lake to familiar stories like Cinderella and Frankenstein. During the month of December, you can also watch their special holiday tradition, The Nutcracker. All performances take place in the elegant War Memorial Opera House in the Civic Center district. In the Civic Center district, you can also attend fantastic shows by the SF Symphony all year round. Some performances are conducted by the renowned Michael Tilson Thomas, and many others are by famous guest performers and philharmonic symphonies from around the world. They play classical music from a wide range of composers. Sometimes the orchestra even plays live music to the screening of a feature film like 2001: A Space Odyssey or Singin' in the Rain. The SF Opera performs at the War Memorial Opera House, the same venue as the SF Ballet, but from June to July and September to December. This elegant, historic, very large auditorium is the perfect place to watch a show with elaborate costumes and captivating music. Watch North America's second largest opera company perform pieces like Don Pasquale, Madame Butterfly, Rigoletto, and more. You will find several sports-related indoor activities in San Francisco and around the Bay Area. During the cool and rainy winter months, head to one of the sports arenas below to see our local teams play. The Golden State Warriors basketball team plays their home games at the Oracle Arena in Oakland, just across the bay from SF, from October to April each year. These games are great fun with high energy, as Dubs fans are very proud of watching this team soar to success in recent years. They faced off with the Cleveland Cavaliers in the NBA Championship Finals three years in a row, winning the title in 2015 & 2017. The NHL hockey season also runs from October to April, and during this time of year, there is nothing more fun than heading over to the SAP Center (affectionately known as the "Shark Tank") in San Jose. Witness all the excitement in person as the Sharks take on teams like the Calgary Flames, the Chicago Blackhawks, the Anaheim Ducks, and more. Drive an hour south of SF or take the Caltrain to get here. In addition to these two professional teams, you can also head over to watch some great basketball by the Cal Bears at UC Berkeley in the East Bay. This team plays in the NCAA Pac 12 Conference against other big schools like Stanford, USC, and the University of Oregon. They play at Haas Pavilion on the southern side of the Berkeley campus from October to February. You can easily get here from San Francisco on BART, the Bay Area's inter-city subway train. You will also find plenty of indoor events during the cool rainy season. These are just a few of the most popular options. Every February in San Francisco, the SF Chronicle hosts the largest American wine competition in the world. Professional judges select winners for over 100 categories from thousands of entries, then give the public a chance to taste what they deem to be the best wines in the country. You'll not only sample award-winning wines, but also delicious bites from local gourmet food suppliers. The tasting event takes place at Fort Mason. Wine lovers in San Francisco are lucky to have over a dozen tasting events to choose from each year. While some of them are wine walks around to participating merchants in a certain area, others are held completely indoors, under one big roof like Fort Mason or the Metreon. Some festivals focus on just one variety of wine, such as zinfandel, pinot noir, or rhone. Attending a wine festival is a fantastic way to relax and enjoy an afternoon mingling with others who share the same love for wine as well as the winemakers themselves. If you're in town during the months of November and December, check out one of the season's most popular indoor activities in San Francisco, the Great Dickens Christmas Fair at the Cow Palace. This event brings to life the holidays of the Victorian era, complete with period costumes, lamplit lanes, carolers, and the warm aroma of roasted chestnuts. You'll feel like you truly traveled back in time to this enchanting place as you browse the very British food stands, apothecaries, antiquarian bookstores, candle shops, and more. Discover the nine best arts and crafts fairs in SF, the perfect places to find unique pieces of jewelry, artwork for the home, furniture, and more. These events are particularly great around the holidays, not just to duck inside from cool weather, but to look for interesting and memorable gifts for loved ones. Most of these fairs feature local artists, so you'll know you're bringing home something special from San Francisco. One of the most entertaining indoor activities in San Francisco takes place at the beginning of the year. If you visit during January, chances are you'll get to attend some hilarious performances at the SF Sketchfest. This comedy festival lasts for nearly three weeks, offering a fun variety of skits, improv, and stand-up by famous and local comedians. In previous years, guest performers have included Dave Barry, Alan Arkin, and Billy Crystal. The shows are offered at different venues all over town. One of the favorite indoor activities in San Francisco is the plethora of film festivals that take place periodically throughout the year, each based on a different theme or genre. These festivals are a great way to delve deeper into a topic that interests you, or get exposed to new cultures and hobbies. You'll find the Ocean Film Festival, Human Rights Film Festival, Dance Film Festival, and more festivals about Arab, Irish, and other cultures. Attend San Francisco's beer festivals to discover the variety of excellent craft brews they have to offer, sample delights from the city's best food trucks, and spend the afternoon chatting away with the creative souls behind these treats. Several of the festivals are at the Fort Mason Center, while others are on the pier or at different pubs around town. Whether you love a sweet amber ale or a smooth dark stout, this is by far not a bad way to spend the day indoors. One of the best nighttime indoor activities in San Francisco is attending a live music concert at one of the many intimate or large venues in SF. Some big names come to play at the Fillmore, the Warfield, and the Bill Graham Civic Auditorium, while really big names play at nearby large sports arenas in Oakland and San Jose. Check out the full calendar of shows in the area, as well as links to discounted tickets. Now go enjoy SF's prominent music scene! Apart from the previously mentioned Sketchfest Festival in January, SF has live comedy performances nearly every night of the year. These include fantastic stand-up acts by local celebrities and international visitors on the stage at Cobb's Comedy Club and the Punch Line. The SF comedy scene also includes improv performances by BATS Improv, as well as long-running satirical musicals like Beach Blanket Babylon. Head indoors to sample some of the best local wines from Napa, Sonoma, and other Northern California wine regions. My list of wine tasting rooms also includes some of the best wines made right here in San Francisco! It's another one of my favorite indoor activities in San Francisco.